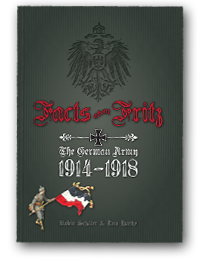 The centenary of the First World War may be upon us but despite all the new books, media articles and television programmes I think it is fair to say that even for those of us who have a strong interest in the war, our knowledge about the German Army is still surprisingly lacking. Despite the excellent work of historians such as Jack Sheldon and Ralph Whitehead, the number of English-language books about the German Army during the war remains low. However it has just increased by one very worthwhile contribution. Enter Mr. Rob Schäfer. I have been a follower of Rob’s for some time now on Twitter, and he is seen as the ‘go to’ person for anything related to the German Army in the First World War (and the Second too, come to think of it). His knowledge is second to none and quite frankly most of the time even his English is better than mine. The centenary period is already proving busy for him as he has helped to devise and lead a new tour for Leger Battlefield Tours entitled ‘Fritz and Tommy’. For this new work Rob has teamed up with another of the Twitterati circle, Tim Hardy, graphic designer by day, and night too it seems. Together they have produced a fine introduction to the wartime German Army. The design and production are faultless, and the book is liberally illustrated with relevant photographs and graphics. It is set out as a number of standalone facts, covering topics as diverse as casualties, weapons, equipment, slang, and even the use of dogs. Many of the statistics and stories Rob has included make for sober reading, not least the 14 year old who was killed on the last day of the war. Perhaps the most fascinating section for me is that on ‘Beutepanzer’, or the use of captured British tanks, an area I had no knowledge about prior to reading this volume. The book is short (each fact is roughly one to two pages) and can easily be read cover to cover or dipped into for reference. The encyclopaedic knowledge of Rob Schäfer combined with the design prowess of Tim Hardy have resulted in a fine piece of work. My only complaint is that I was left wanting more. However with four more years of the centenary ahead, I look forward to seeing what further projects Rob and Tim get involved in.